On February 25, the Chinese Communist Party proposed the removal of term limits for Chinese presidents and vice-presidents. This would allow President Xi Jinping to continue on as president indefinitely. His second term will begin this month. The Constitutional clause limiting terms was added in 1982 by Deng Xiaoping, who sought to prevent the rise of personality cults. The limits restricted the President and Vice-President to two consecutive five-year terms. Previously, Mao Zedong had spent three decades in power without significant opposition, leading to several disastrous policies, most notably the Great Leap Forward and the Cultural Revolution. The destruction and chaos of Mao’s years in power eventually led to sweeping reforms by Deng Xiaoping. Term limits, in conjunction with the established norm of retirement from party positions at 68, were intended to reduce the length of time a leader could spend in power, thus minimizing the effects of potentially harmful policies. Most experts anticipated President Xi Jinping would take measures to extend his presidency, since no successor was appointed during the most recent Chinese Communist Party Congress. The appointment of a successor has been the norm for Chinese presidents starting their second term. Despite these predictions, many were surprised by how quickly this change came after the October 2017 Party Congress. While the immediate response of the state-run media was overwhelmingly positive, a few public figures have made statements in opposition to the repeal, most notably former China Youth Daily editor, Li Datong. Li warned the removal of term limits “will be considered a farce in Chinese history.” Dissent on the internet was largely restricted, with phrases such as “I don’t agree” and ” proclaiming oneself emperor” censored. Western media was baffled by the censorship of the letter “n”, which was done in an effort to prevent critics from expressing dissent mathematically (n>2, where n=the number of Xi’s terms in office). While there has been opposition, many also appear optimistic about this change. Zhu Ning, an economist with Tsinghua University, believes the “stability and clarity” provided by President Xi will be beneficial to China’s economy. This stability may also be helpful for Xi’s more ambitious economic policies, such as the One Belt, One Road (OBOR) initiative. The OBOR is a long-term trade and infrastructure project that will extend far beyond President Xi’s second term. As the creator and driving force behind this initiative, the success of the OBOR will remain a top priority for as long as Xi remains in power. The National People’s Congress (NPC), which started its session on March 5, is expected to approve the repeal of term limits on March 11. The almost 3,000 delegates meet annually to discuss laws and set economic targets. Many have criticized the NPC for its lack of power, calling it a “rubber-stamp legislature.” It has earned this title because no proposal has ever been voted down in the more than 60 years the NPC has been meeting. It is therefore not surprising that there have been no public statements by members of the NPC disparaging the eradication of term limits for the president. 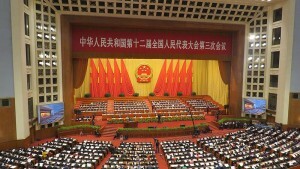 In fact, Members of the Congress expressed firm support, reporting that this measure is approved by the “common folk” and is “the will of the people.” As the New York Times notes, “gauging public opinion in an authoritarian country is difficult,” so it is unknown if the Chinese people really approve of the removal of term limits. Although they have received far less attention from Western media, the NPC is also expected to pass several other significant changes to China’s Constitution. President Xi’s political theory, “Socialism With Chinese Characteristics for a New Era” will be written into the Constitution, solidifying his influence and legacy. There will also be a new anticorruption commission written into the Constitution as an amendment. This commission will be a permanent part of the state, without oversight from the judiciary or other state agencies. This will allow the Communist Party to expand oversight to include all public servants, even those who are not members of the Party, on a permanent basis. These changes will further strengthen the Communist Party’s, and Xi Jinping’s, control over the Chinese government. While many in China are optimistic about President Xi’s continued leadership, some have cautioned against allowing Xi Jinping to amass too much power for fear of repeating the mistakes of Mao. President Xi and President Trump appear to have a congenial relationship, despite the fact that U.S.-China relations have been strained over the past few years. The two countries have many disagreements, particularly over the balance of trade and China’s increasing naval power. President Xi has reinvigorated Chinese patriotism with the strengthening of China’s military and the assertion of China’s territorial claims in the South China Sea. If Xi builds up the same vehement, unchecked support as Mao, the same cult of personality, it will only increase the possibility that the myriad of disagreements the U.S. and China share could spiral out of control.